Makes 20 servings, about 2 Tbsp. dip and 11 WHEAT THINS each. Crush 22 WHEAT THINS to form fine crumbs; place in medium bowl. Add nuts and butter; mix well. Stir in 1/4 cup sugar. 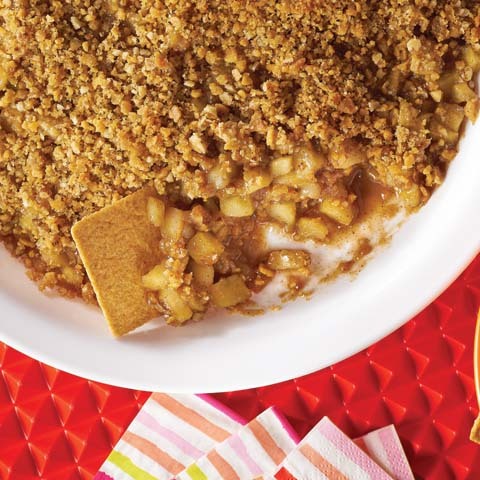 Toss apples in large bowl with lemon juice, cinnamon and remaining sugar until evenly coated. Add 1/2 cup crumb mixture; mix lightly. Spread apple mixture onto bottom of 9-inch pie plate sprayed with cooking spray; top with remaining crumb mixture. Bake 30 to 35 min. 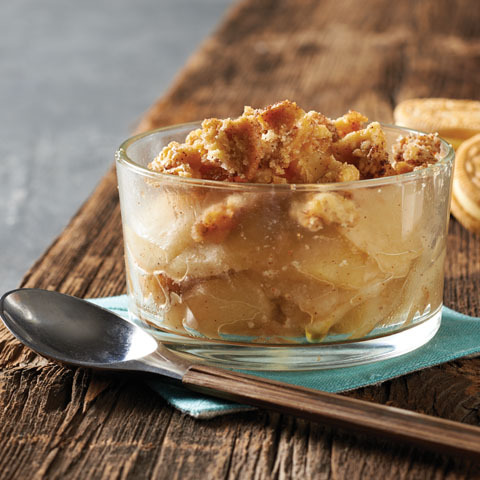 or until apples are tender and dip is hot and bubbly. Cool slightly. 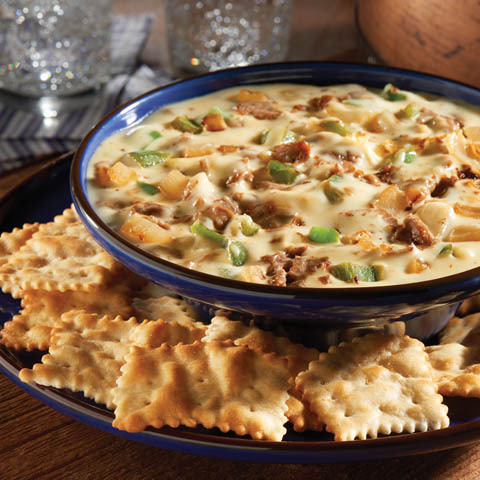 Serve with additional WHEAT THINS. 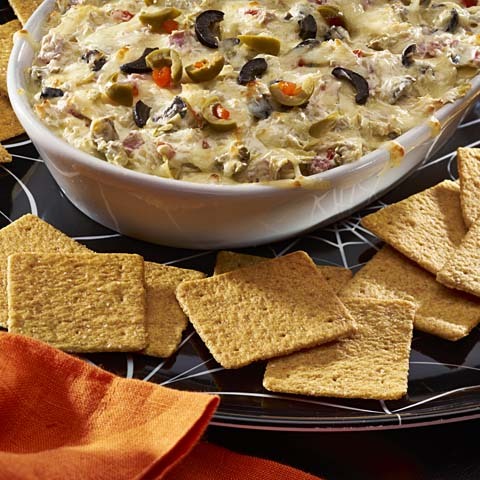 VariationInstead of serving as a dip with additional WHEAT THINS, spoon over scoops of ice cream or frozen yogurt. How To Crush WHEAT THINSPlace WHEAT THINS in resealable plastic bag. Flatten bag to remove excess air, then seal bag. Crush WHEAT THINS into crumbs by using a rolling pin to roll across bag. Some small pieces may not crush completely. Try Using a Variety of ApplesThe range of apple varieties available in supermarkets or at farmers' markets is inspirational. 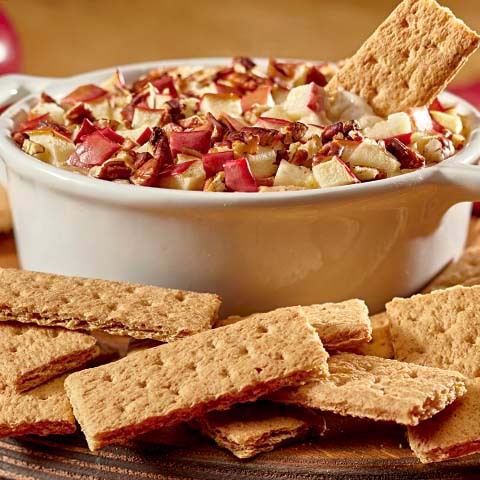 For a change of pace, try preparing this delicious dip with other apple varieties, such as Braeburn, Fuji, Golden Delicious or Honey Crisp.